Corrine's Paper Crafts: Peek Of The Week - Delightful Debbie! For this Peek of The Week Day I’d like to share with you, with Debbie’s kind permission, two excellent cards made by Debbie Faulkner. Debbie is a dedicated crafter; not only does she craft at home, but she has a caravan, and she also crafts when spending time there. She must have a real love of crafting because she doesn’t like to be away from it - she has a ScanNCut machine in her caravan, which is a brilliant solution to an obvious problem… as anyone who has ever spent time in a caravan knows, storage space is always at a premium. We crafters collect a whole lot of dies as time goes by, and these dies take up storage space – but by putting a ScanNCut machine in there, Debbie doesn’t have to worry about transporting and storing dies… an elegant solution to a practical problem. Debbie made this card using the ScanNCut , and she used her new Shaped Cards USB. Isn’t this card fantastic? 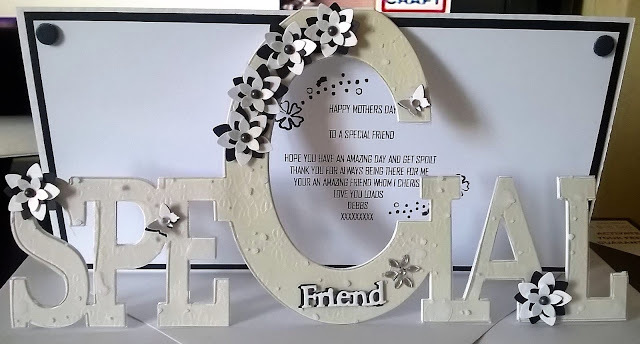 It’s a Mother’s Day card which is basically made from the word ‘special’. 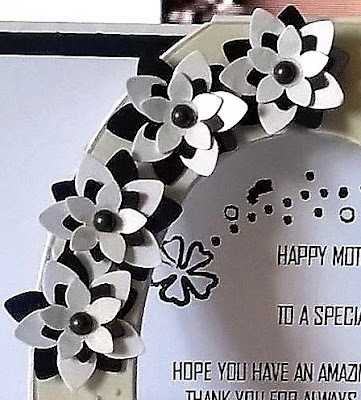 The monochromatic theme is really eye-catching and I believe maximises the impact of the card. It’s an extraordinary idea brilliantly executed. Debbie made this card using the Tattered Lace Twist and Pop Die set that we featured on the TV shows a couple of months ago. 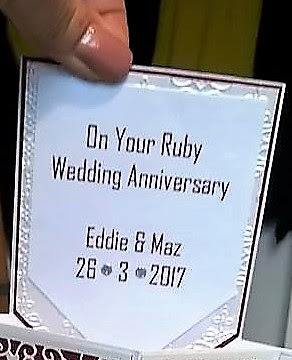 This Ruby Wedding Anniversary card is really special – as special as the event itself! 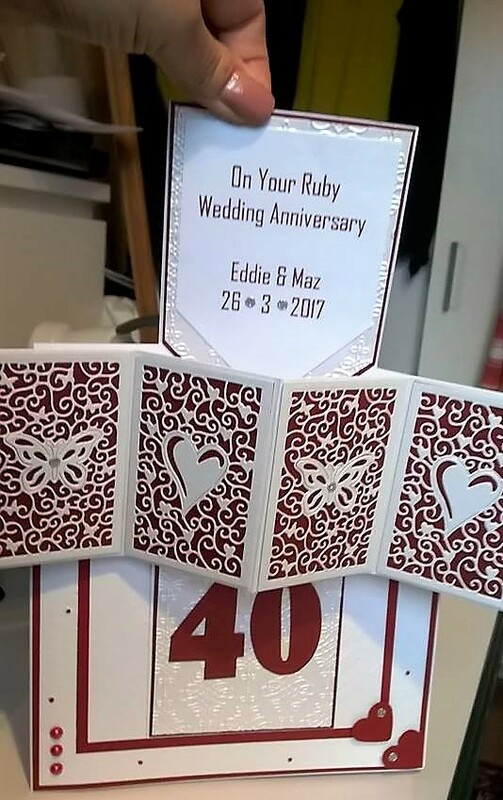 I’m sure it is totally different to any other card the lucky couple received on the happy day. What I love about the Twist and Pop Die set is that once you’ve made the Twist and Pop mechanism you can then put it inside any card blank of your choice … and isn’t that a lovely surprise for the recipient when they open the card. 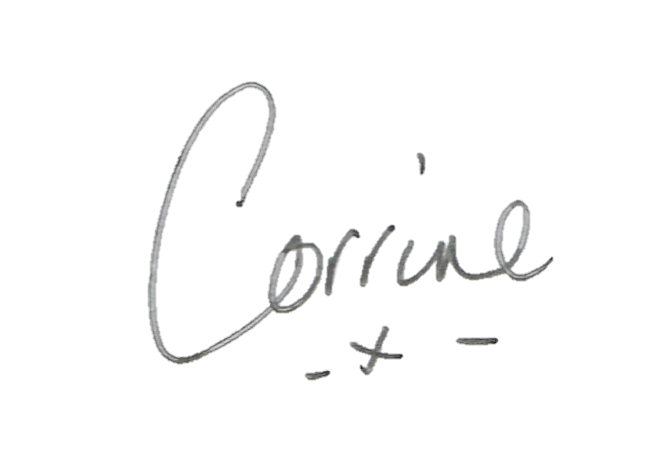 Debbie, many thanks for allowing me to share your cards. Only someone devoted to crafting would believe that a few days away from it all in a caravan certainly doesn’t include a few days aways from their favourite pastime! These cards are both beautiful and really well executed, and I’d love to know what the recipients’ reaction was on opening them!